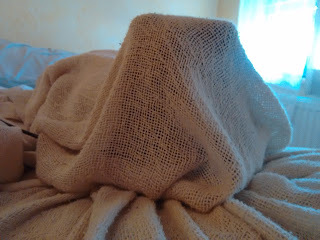 Moo recently got crafty and decided to forgo the glue and shape a cheesecloth ghost out of nothing other than...wait for it...himself and a blanket. Isn't he a creative kitty? He was not amenable to me removing him from his artwork but I had places to go. He tried to convince me that he is a ghost but he was just too cat-shaped to be convincing.